I was so excited one day a few years back to receive a box full of leafless sticks by mail. 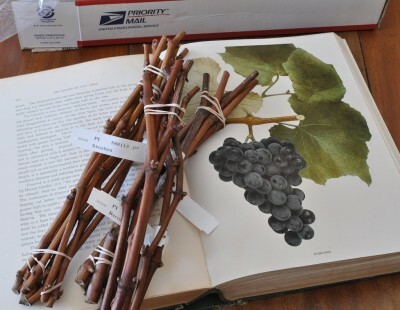 The exciting thing about those sticks was that each one of them could grow into a whole new plant from whose branches would eventually hang luscious apples and grapes. And how did I know the fruits will be luscious? Because a year prior I was at an experimental orchard getting fruit photos for a book I was working on. Of course, I couldn’t help but also taste the fruits, and that’s why Chestnut Crab, Honeygold, Mollie’s Delicious, and King of the Pippins joined the two dozen or so other varieties of apples I already grew. Cayuga White, Bertille Seyve 2758, Steuben, Lakemont, Wapanuka, Himrod, Romulus, and Venus joined my grapes. Water Freezes. Why Don’t Plants? Not being able to don gloves and a scarf, or shiver, to keep warm, it’s a wonder that trees and shrubs don’t freeze to death from winter cold. They can’t stomp their limbs or do jumping jacks to get their sap moving and warm up. The sap has no warmth anyway. 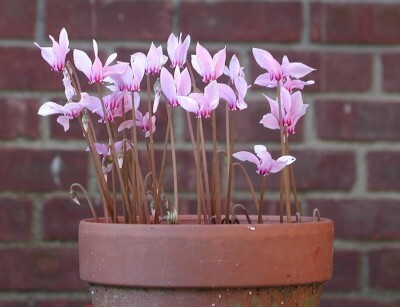 Sometimes, of course, plants do succumb to winter cold. 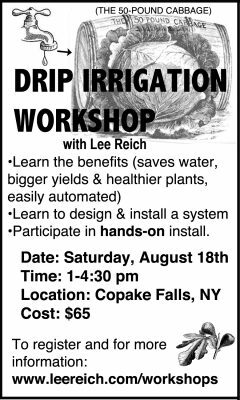 But usually that happens to garden and landscape plants pushed to their cold limits, not to native plants in their natural habitats or to well adapted exotic plants. Plant growth has come screeching (almost) to a halt. Lettuces just sit, hardly growing. No wonder, you are no doubt thinking. It’s getting colder and colder outside. I know that, but I’m writing about lettuces in my greenhouse. The issue isn’t lack of heat. It’s lack of light. I’ll admit to being an addict. But my addiction — to propagating plants — is benign. 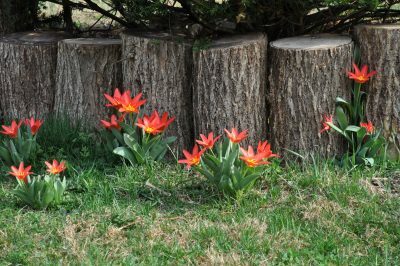 It pains me to throw away an interesting seed or pruned-off stem; either can grow into a whole new plant, anything from a charming little flower to a towering tree. Gardening is so much about planning for the future. Dropping seemingly dead, brown specks into a seed flat in spring in anticipation of juicy, red tomatoes in summer is fun and exciting. But now, in the glory of summer, I don’t particularly like planning, which means thinking forward to the crisp days of autumn that lie ahead. But I must. I know that when that time finally comes, I’ll have had my fill of hot weather. And the cooler weather coupled with shorter days and low-hanging sun will have tomatoes, cucumbers, peppers, and other summer vegetables on the wane. Planning and action now let me have a whole other garden come autumn, a garden notable for its shades of green (from leaves) rather than the reds and yellows (from fruits) of summer’s garden. 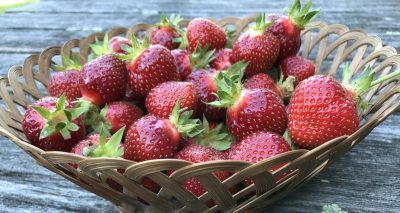 Every day, for some time now, my strawberry bed has yielded about five cups, or almost 2 pounds of strawberries daily. And that from a bed only ten feet long and three feet wide, with a double row of plants set a foot apart in the row. Good yield from a strawberry bed has nothing to do with green thumbs. I just did what’s required to keep the plants happy and healthy. To whit . . . I planted the bed last spring to replace my five-year-old bed. 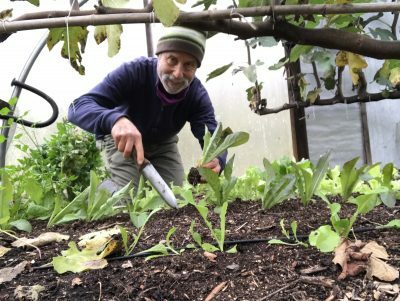 About five years is about how long it takes for a strawberry bed to peter out due to inroads of weeds and diseases, including some viruses whose symptoms are not all that evident. My vegetable garden is in beds. Your vegetable garden is in beds. Seems like just about everybody plants in beds these days. And with good reason. Beds make more efficient use of garden space. Soil compaction is avoided because planting, weeding, pruning, and harvesting can be done with feet in the paths. 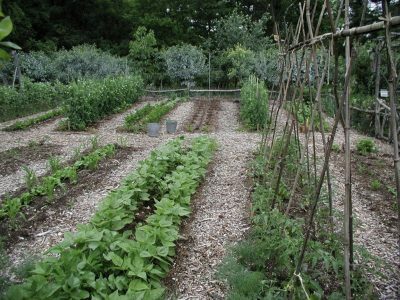 And the shapes of the beds can help make even a vegetable garden look prettier, especially with decorative plants edging the beds. 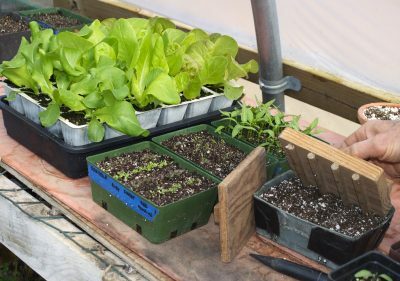 Raised beds are also one way to grow happy plants in otherwise poorly drained ground, or in ground that has been contaminated by lead or arsenic. Such contamination is likely to occur from past use of leaded gasoline near roadways, from old paint near buildings, and from residual pesticides in sites that were once orchards. As the train rolled southbound along the east bank of the Hudson River, I took in the varied landscapes along the opposite west bank. Spilling down the slope to the river on that bank at one point was what appeared, from a distance, to be a vineyard. I was envious. What I did envy was the microclimate of the site. Microclimates are pockets of air and soil that are colder, warmer, more or less windy, even more or less humid than the general climate, due to such influences as slopes, walls, and pavement. 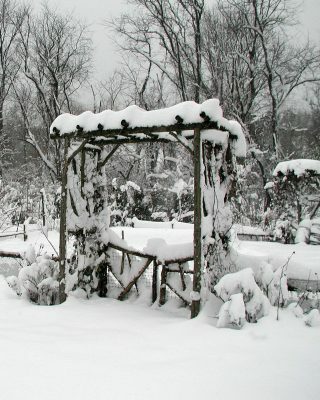 Snow today (March 7) — a perfect time to plant seeds outdoors. Yes, really! Obviously, not just any seed can be sown in snow. The ground is still frozen solid so I can’t easily cover seeds with soil. And cold temperatures are going to rot most seeds before the weather warms enough for them to germinate and grow. I’m planting poppy seeds. It does seem harsh to sow a flower whose seeds are hardly finer than dust and whose petals are as delicate as fairy shawls. 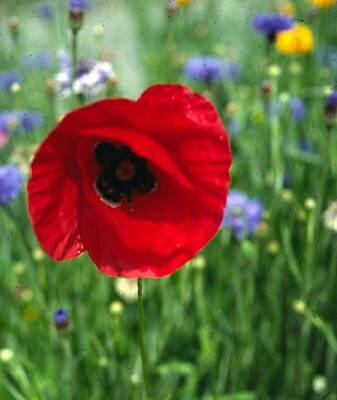 But early sowing is a must, because poppy seedlings thrive during the cool, moist weather of early spring. Covering the seeds with soil? No problem: Poppy seeds sprout best left uncovered. And because poppies don’t transplant well, their seeds are best sown right where the flowers are going to grow.